What types of classroom activities will be available for my child? 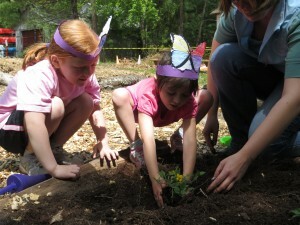 Inviting opportunities in the out-of-doors that develop enthusiasm for learning. Multi-sensory arts, crafts and cooking activities that encourage experimentation, discovery, and independence. Opportunities to dictate stories and create charts, books or letters imparting environmental education into language, math and art. Cooperative play time that strengthens children’s social skills, supports emotional development, and builds confidence. What is the role of families in the Preschool program? Visits to your child’s class are welcomed! Nature Center Preschool welcomes all families and celebrates the many cultures represented in our Y community. We hope you can join us for special events, celebrating your child’s birthday and participating in daily indoor and outdoor activities. Our Family Advisory Council is made up of volunteers from Nature Center Preschool families who serve as liaisons between families and teachers. Council members are invited to regularly scheduled meetings to discuss ideas for enhancing the preschool and share feedback from families. Our dedicated volunteers also provide input regarding local community needs, guidance for preschool fundraising activities and embrace the mission and philosophy of the Nature Center Preschool, South Shore Natural Science Center and the South Shore YMCA. We strongly encourage families to be involved in fundraisers that contribute to scholarships and equipment for the Preschool, to the Science Center as a whole, as well as the South Shore YMCA’s Change a Life Fund. Why is it important for my preschooler to learn about nature? Research shows that children who have opportunities for free play in nature have greater higher-level thinking skills that include planning, organizing, sequencing, and decision making. The outdoors is less restrictive on gross motor play and creativity affording open ended and imaginative play experiences. Direct encounters in nature stimulate all the senses, create opportunities for assessing observations about the environment where children live and play, and create a sense of interconnection with the natural world. Whether children are collaborating during field exploration, walking the South Shore Natural Science Center trails in search of underground animal homes, planting seeds in our Children’s Garden, or listening for frogs near our vernal pools, they are essentially strengthening their whole development. Through a combination of Nature Center Preschool classroom and outdoor experiences, children will build skills for lifelong learning.